BELL COUNTY, TX — Two Bell County corrections officers were terminated by the Bell County Sheriff's Department on Thursday. 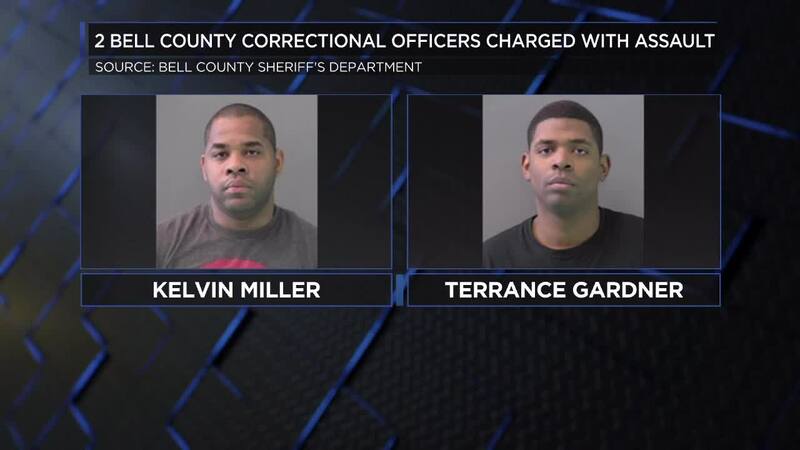 According to the sheriff's department, officers Kelvin Miller and Terrance Gardner were fired on Thursday. On Monday, the former officers were charged with assault. On March 14, Bell County Sheriff Lange met with the family members of an inmate at the Bell County Jail. The family had concerns for the inmate's safety and wanted to report some possible wrongdoings by some of the correctional officers. Sheriff Lange, along with jail administration, began an internal investigation. That investigation turned up some "disturbing events" that warranted the notification of the Texas Rangers. The investigation ended on Monday. Officers Kelvin Miller and Terrance Gardner were charged with assault with bodily injury and violation of civil rights of a person in custody. Both Miller and Gardner turned themselves into the Bell County Jail without incident and bond was set at $5,000 per charge. Both officers bonded out of jail. The sheriff's department is continuing their internal investigation.